The heat from the steam relaxes those pesky wrinkles resulting in clothes looking so fresh you'd think they came from the dry cleaner. Single items or small loads can be dried quickly whether you're on the go or just want something dried fast. With optimized heat and airflow, this cycle gets your toughest loads completely dried faster. It runs hotter and works harder to power out moisture. Designed, Engineered and Assembled in the USA. The Front Load Electric Dryers Large Capacity Dryer with Sanitize Cycle and PowerDry System – 7.4 cu. ft. by Maytag at Furniture Fair - North Carolina in the Jacksonville, Greenville, Goldsboro, New Bern, Rocky Mount, Wilmington NC area. Product availability may vary. Contact us for the most current availability on this product. Width (side to side) 27"
Depth (front to back) 31"
Height (bottom to top) 39"
Make laundry as easy as it should be with these electric dryers. 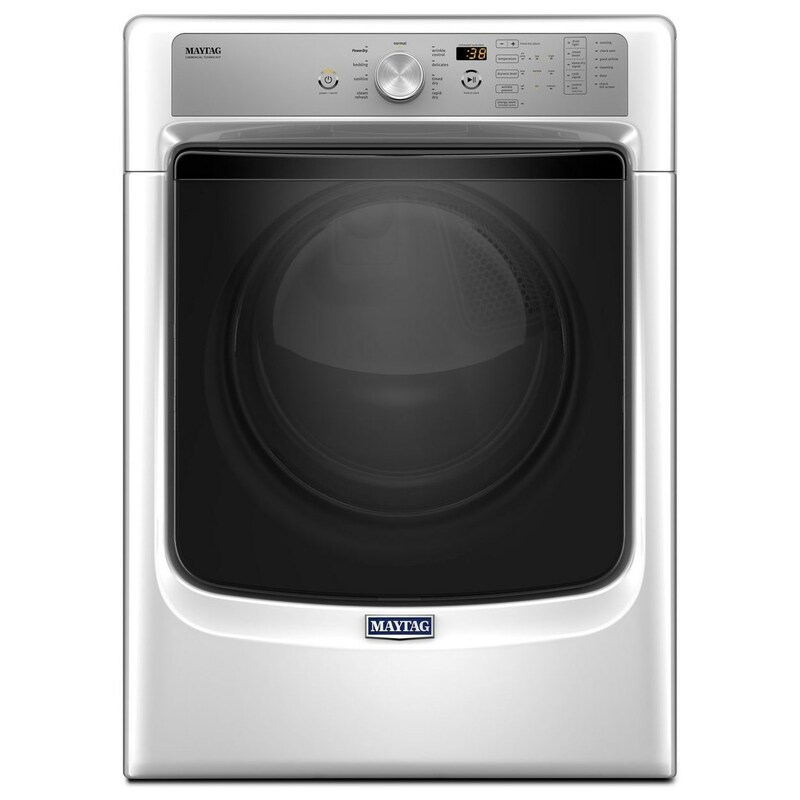 From the belt and bearings to a durable metal motor, these premium dryers feature Maytag Commercial Technology (MCT) and long-lasting commercial-grade components for your home. With multiple cycles, options, and temperature settings, y0u will be able to accordingly care for your clothes with ease. Choose a dryer that's right for your home and lifestyle. The Front Load Electric Dryers collection is a great option if you are looking for Appliances in the Jacksonville, Greenville, Goldsboro, New Bern, Rocky Mount, Wilmington NC area. Browse other items in the Front Load Electric Dryers collection from Furniture Fair - North Carolina in the Jacksonville, Greenville, Goldsboro, New Bern, Rocky Mount, Wilmington NC area.